MLB’s annual flag-desecration spectacle began yesterday, as teams started trotting out their stars/stripes gear. In a fitting development, the first team to wear the star-spangled uniforms costumes was the Tigers (including starting pitcher Mike Fiers, shown above), who were playing an afternoon game in Toronto. Let that sink in for a second: An American team wore Fourth of July uniforms on July 2, in a foreign country. Sure, makes perfect sense to me! As for the rest of the teams, you know the drill by now: Most teams looked bad, a few teams looked okay, the Cardinals looked diseased, the Rockies and Pirates looked particularly bad (as they always do because their color schemes aren’t a good match for the stars/stripes costumes), and the A’s would’ve looked worse but they had the day off. But hey, they’re playing tonight — can’t wait! You can see lots more photos from last night’s games here. [T]eams will now be able to wear their alternates/throwbacks or color rush jerseys on three occasions during the season. It used to be that teams could wear the former only twice, but this gives teams the option to wear them three times. The upshot? The Rams will probably wear the blue-and-yellow throwbacks three times, and should be able to avoid wearing the mismatched blue-and-gold jerseys with the white-horned helmets. Here’s another way of looking at it: For a long time, teams could have only one alternate or throwback uniform per season, which they could wear only twice. Then that was supplemented by the Rash, which was worn on Thursdays. Now the Rash is no longer required on Thursdays, but the Rash designs have been retained in teams’ wardrobes, which essentially means that teams can now have two alternate or throwback uniforms — the standard throwback/alt and the Rash — which can be worn a total of three times. And really, there’s nothing new about that, because several teams wore the Rash for non-Thursday games last season. The new rule just codifies what was already happening on the field. Bottom line: The Rash is the new second alternate, which was probably the plan all along. Take a look at this official ABA basketball from Rawlings — the red/white/blue color scheme is perfect for tomorrow’s Fourth of July holiday, right? 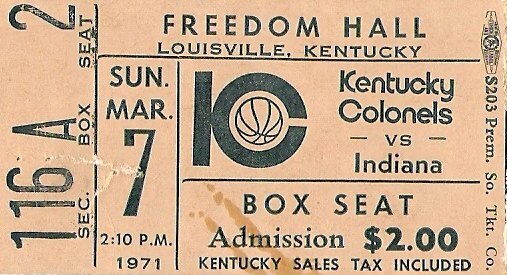 Got a great story for this one, too: Now, way back when I went to a Kentucky Colonels ABA game at Freedom Hall in Louisville, I got a game program, and at halftime they called the “lucky number” to go out onto the floor at halftime and shoot a free throw. That was me! Make the shot, I get season tickets. Miss it, I get an official ABA ball. Those words are crucial. Not too much pressure, right? So, my quick thinking told me that since I was in elementary school there’s no way I could go to all these games at night. But I’d always coveted a real game ball. I was very much into the Colonels. Even back then, I Got It™ — I loved that sharp KC logo. So I just tossed it up there and missed on purpose. Oh, too bad, son, but here’s your ball. Except it wasn’t a real ball, it was just a cheap plastic-y replica in a plastic bag with a twist tie! Not like this one that’s available for close to three grand! Yes, I’m still bitter about this. • One more from the ABA: Look at the cover art of this 1968-1969 game program for the Miami Floridians/Kentucky Colonels. 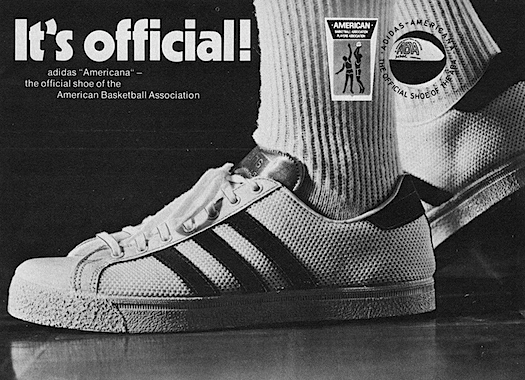 It says “Cage Stars” on the front and has a Pro Keds ad on the back — “The only basketball shoes ever endorsed by the ABA” (well, until Adidas came calling with more money). 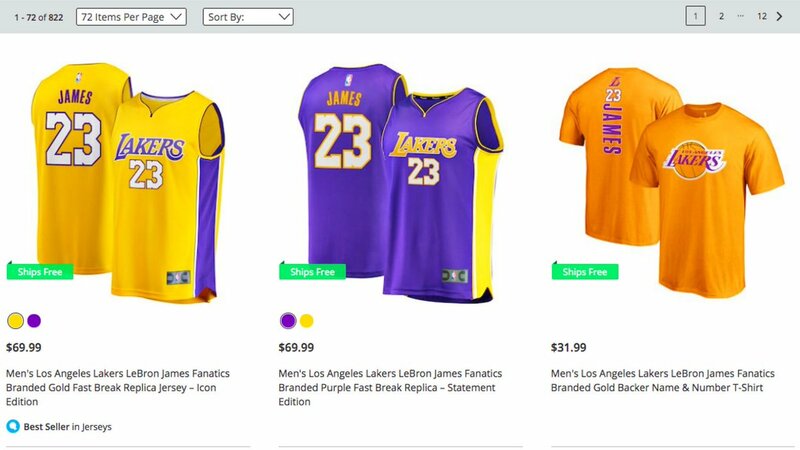 • As of this writing, LeBron James Lakers jerseys were already online and ready to go. • Here’s something that Broncos fans can hang their hat on. And their coat, too. This coat and hat rack was produced by Hutch in the 1970s and looks like it’s in pretty good shape. Hutch was a popular maker of kids’ replica NFL gear back then. Little bit of a nick on the helmet striping, but so what. • Eagles fans will love this helmet snack bowl. The eBay listing says “1970s era,” but it’s certainly more contemporary that that. • For the NY Giants fan at Uni Watch HQ: Here’s one of those 1970s button plaques with the stand on the back. You’re supposed to be able to wear this, hence the pin. It’s mammoth as far as pins go, but for a desk accessory it’s pretty nice. • Collect and wear these official NHL crests! Like this one for the New York Islanders. • Rah! Rahs! Official Pro Sports made this 1970s Pittsburgh Pirates button. • Check out this 1960s NHL “National League Electric Hockey” game from Eagle Toys. Great-looking box art. • This 1970s NFL Alumni garment bag was once owned by Bill Glass of the Lions and Browns. • Technigraph alert! Doesn’t get more retro NFL than this 1960s Falcons plaque. • Here’s a team-issued New England Patriots gear bag. It’s from the 1970s-1980s, and belonged to #96. 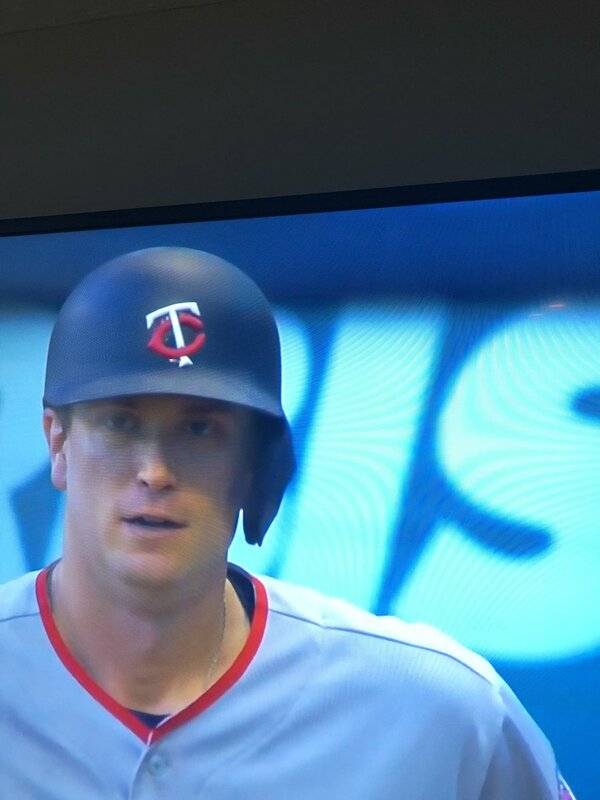 Baseball News: Twins P Kyle Gibson had an askew 3D helmet logo during an at-bat last night (from Mike Sellers and Craig Van De Kreeke). 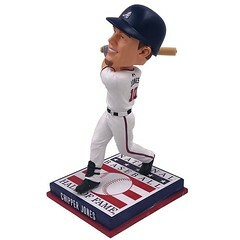 … The Braves are celebrating Chipper Jones’s Hall of Fame induction with a bobblehead that has him wearing a solid-blue batting helmet with the team’s home jersey — a combination he never wore (from Steve Salayda). … The Astros introduced their international free agent signings yesterday, and some of the players were wearing navy softball tops that the ’Stros have never worn in a game (from Ignacio and @MAraiza92). … The Tennessee Smokies, a Cubs AA team, wore jerseys inspired by the Braves’ ’70s feather unis this past weekend (from Travis Autrey). 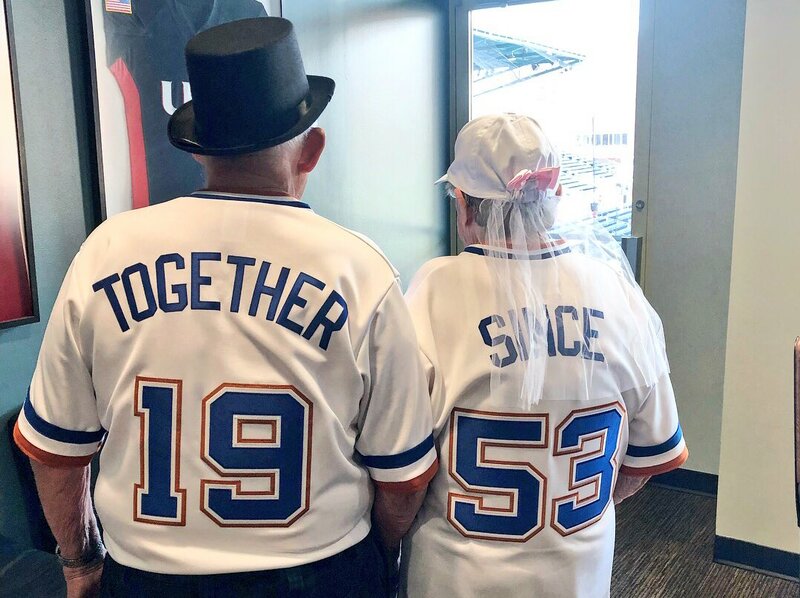 … Two Durham Bulls fans celebrated their 65th anniversary at the ballpark and dressed in jerseys for the occasion (from Lee Wilds). 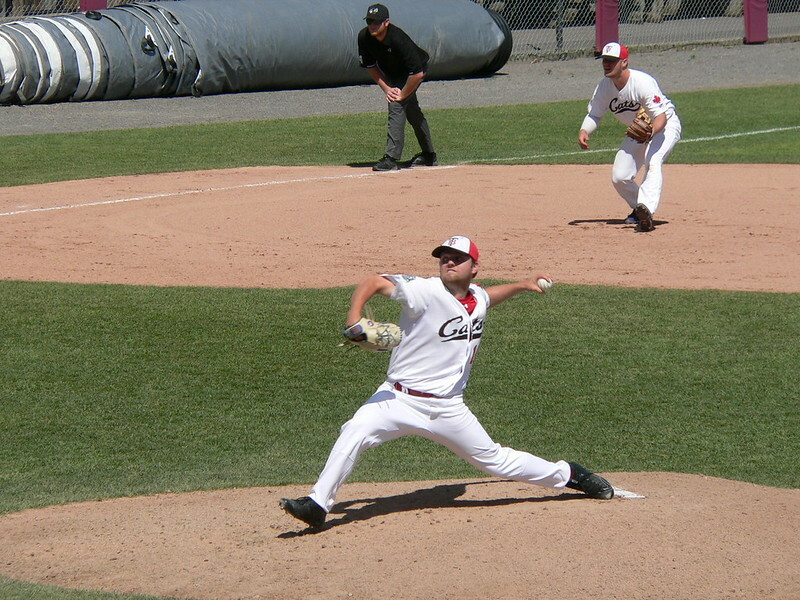 … Based in Thunder Bay, Ontario, the Thunder Bay Border Cats are the only Canadian team in the Northwood Collegiate League. 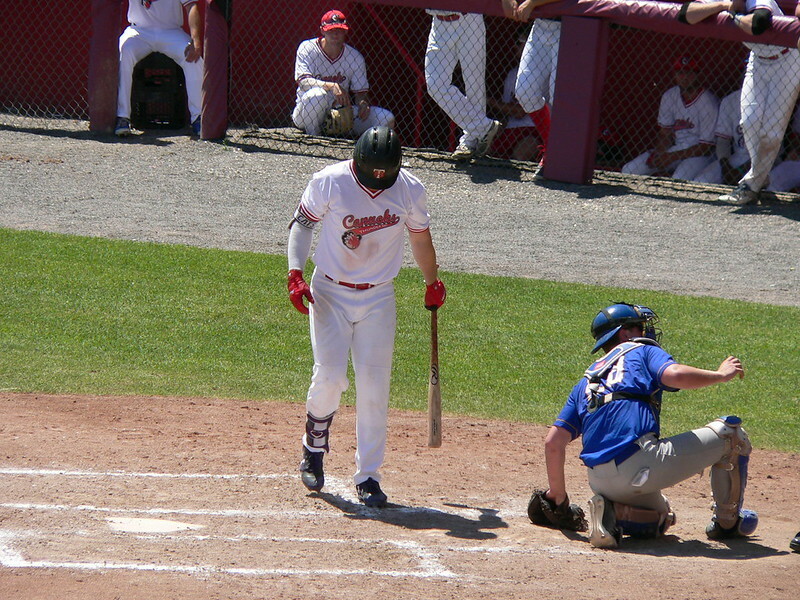 Their game on Sunday was rained out, but they still wore Canada Day jerseys (renaming themselves the Canucks) for the opener of a doubleheader yesterday. They wore their traditional home unis for the nightcap (from Will Scheibler). … We’re all used to seeing overhead shots of baseball diamonds, but check out this one. That very unusually shaped infield is Bobby Morris Playfield in Seattle (from Michael Kent). … Reddit user KiloOscarBravoEcho noticed that the Little League uniforms worn in The Sandlot were later repurposed for Austin Powers: The Spy Who Shagged Me (from JD). NFL News: The Saints will wear white at home against Philly on Nov. 18 because — get this — Saints coach Sean Payton lost a golf bet to Eagles coach Doug Pederson! That’s got to be a first (from Josh Claywell). … Packers S Ha Ha Clinton-Dix was at a fundraising event and signed green Packers helmets with gold facemasks (from Griffin Smith). College Football News: New helmets for Louisiana-Lafayette (from Chad Fields). … Here’s an in-depth look at the various shades of burnt orange Texas has worn throughout the years — an issue that once prompted Texas fans to write an angry letter to the Board of Regents (from Phil). Hockey News: A bagel shop on Long Island is offering Islanders fans a dozen free bagels in exchange for John Tavares jerseys in light of his decision to sign with the Leafs (from John Muir). 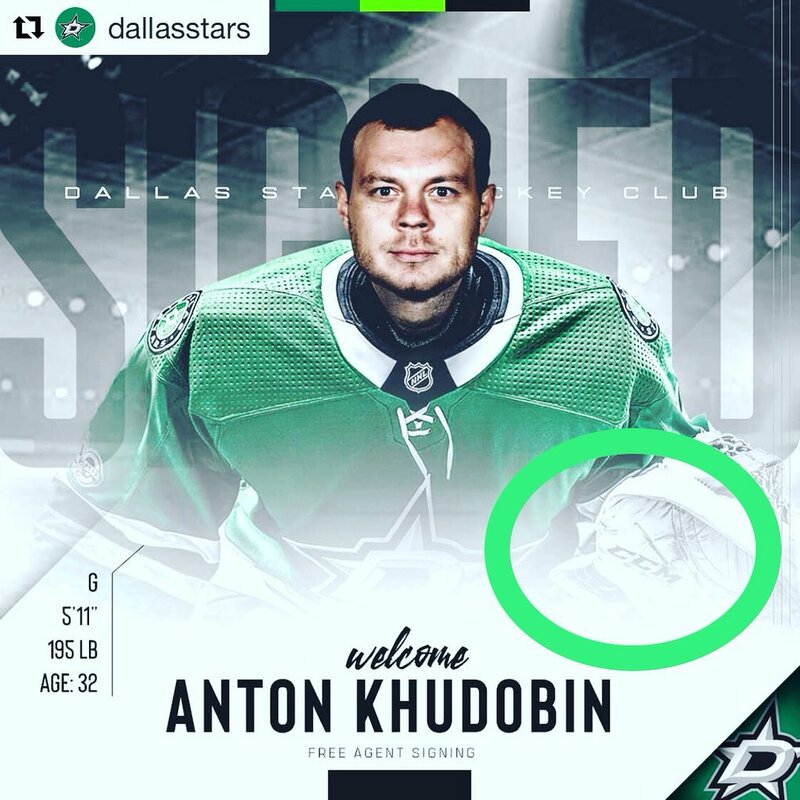 … The Stars signed G Anton Khudobin on Sunday, and the team Photoshopped his head onto G Ben Bishop’s body. The Goal Net says Bishop’s CCM glove is a dead giveaway. … New numbers for new Penguins: C Matt Cullen will wear No. 7 (again), D Jack Johnson will wear No. 73 (from Anakin Forrest). Basketball News: That didn’t take long: LeBron James will continue to wear No. 23 with the Lakers. … With LeBron leaving Cleveland, Sherwin-Williams will remove the iconic mural of James that adorns the company’s headquarters in downtown Cleveland. Here are some suggestions as to who should replace him. … Speaking of LeBron, The Washington Post Photoshopped him into a Lakers jersey but left him in Adidas-era Cavs shorts (from Josh Claywell). 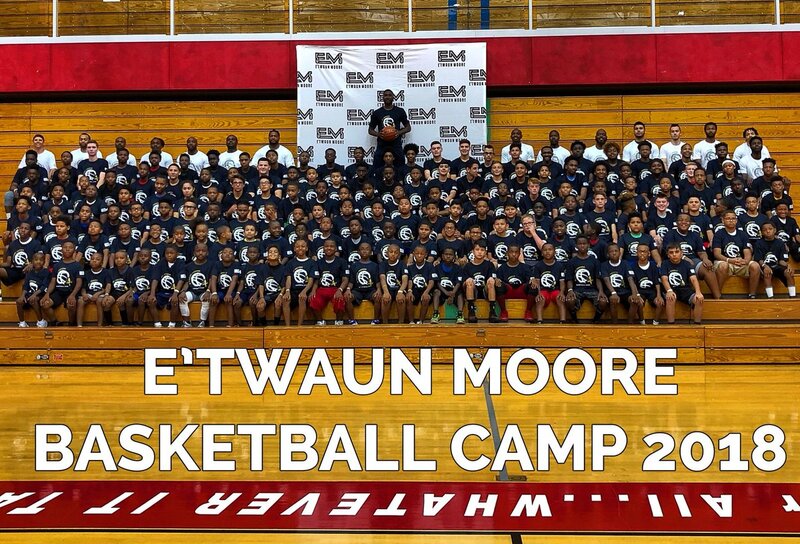 … Pelicans G E’Twaun Moore’s personal logo finds a way to sneak his number — No. 55 — into his initials (from Jarrod Campbell). 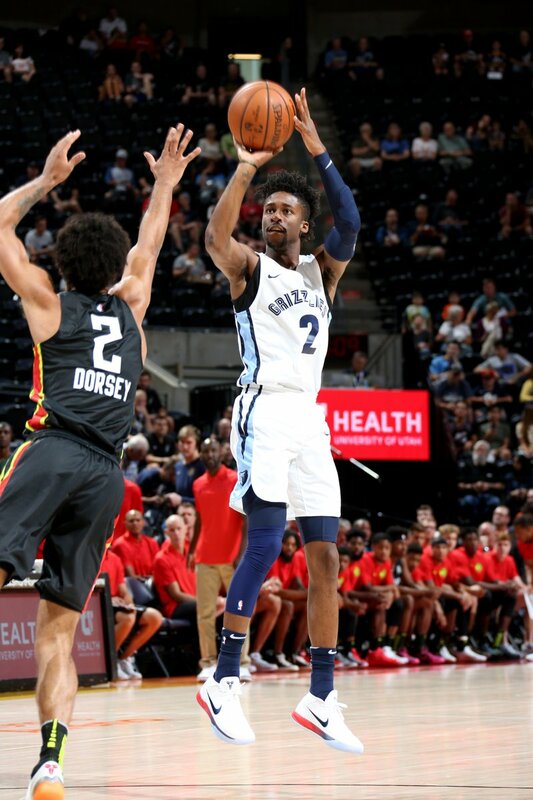 … These are the unis the Hawks and Griz are wearing during the Summer League this year (from Chris Hopkins). 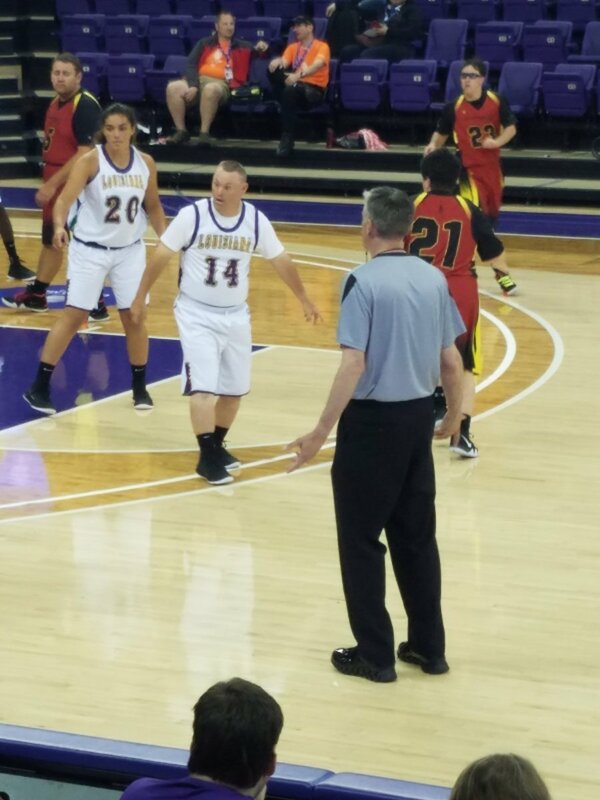 … Check out the uniforms players wore in the Louisiana Special Olympics (from Chris Lather). 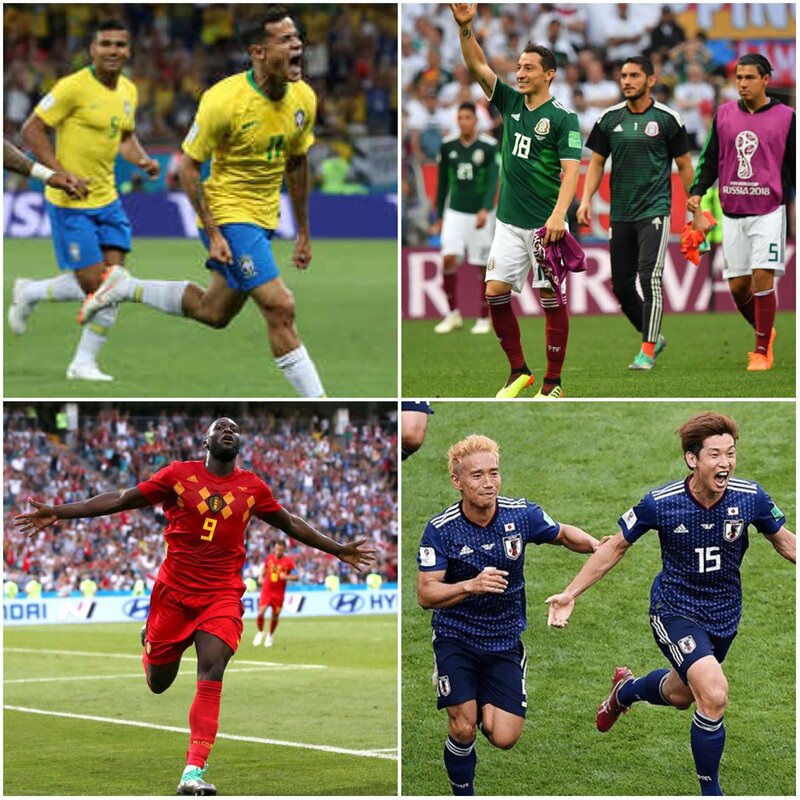 Soccer News: The four World Cup teams that played yesterday — Brazil, Mexico, Japan, and Belgium — all wore their first choice kit. It’s been rare to see two teams wear first-choice uniforms in the same match this year (from @FunkyColdMatina). … Someone mocked up World Cup uniform concepts for Wakanda, the fictional African nation in which Marvel’s Black Panther is set (from Fred Vaughn). … Spanish club Sevilla unveiled all their kits for 2018-19 yesterday (from Jonathon Sluss). … Premier League side Burnley released its 2018-19 home kit yesterday (from Josh Hinton). … German side Hertha BSC’s new home and road kits leaked and then were officially unveiled yesterday (from Ed Zelaski). Grab Bag: And now it’s official: Tennis star Roger Federer is leaving his deal with Nike for apparel company Uniqlo. He’ll still continue to wear Nike sneakers, though, because Uniqlo doesn’t make footwear (from Dan Kennedy). 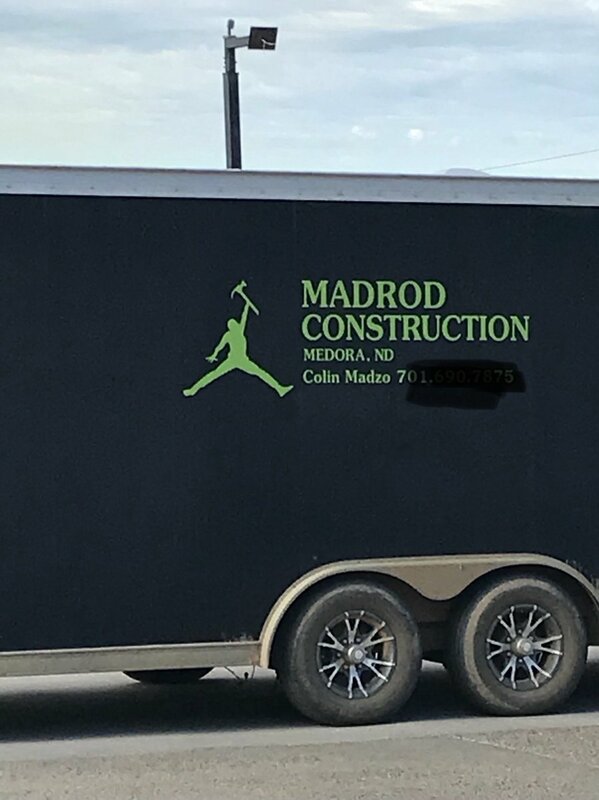 … A construction company in North Dakota is poaching Jordan’s “jumpman” logo (from Jason Simpfenderfer). Can’t help but draw an analogy between MLB’s stars and stripes marathon with the house on the street that over does it during the holiday season with excessive Christmas lights. Too early, and for too long. Might as well leave ’em up for next year now. This is why I love this website, because these are the weird things I sometimes pick up on to. Great observation! He signed plural helemts or “a” singular helmet? Does anyone know where we can see all the new NBA summer league uniforms? They look a lot like if the NBA teams had a college uni for some reason, and I was just hoping I’d get to take a peek at every team. I’d like to see all the Summer League uniforms as well. If they’re all available for viewing in one place, I’m not aware of it. I know I’m in the minority, but I like the Stars and Stripes caps. Not so much the last couple years when the pattern was printed on the cap, but I love this year’s design. Bought a Mets cap. Setting aside the concept behind S&S and all of the feeling on both sides, and looking purely at the aesthetics, for me it depends on the team. As a Phillies fan, the S&S cap design is very similar to the regular red cap. If I were a A’s, Giants or Rockies fan, I would probably feel very differently. Holiday uniforms should all be eliminated. Agreed. A day at the ballpark is “America” enough. No need to cram it down our throats with stupid looking costumes. Many thanks for including my ticker entry about Chipper Jones’s bobblehead. One point of clarification, the bobblehead is produced by the National Baseball Hall of Fame. The Braves didn’t get this one wrong, unlike the wrong ear flap debacle of 2016. Hopefully, the Astros will replace the current Sunday softball top with the one worn by the international signees. These look much better. I think the NFL has restricted themselves in a strange way with the Color Rash. That concept led to such bad (and rushed) design. To go with that as your first real alternate design program has led to bad jerseys beyond the bad one usually gets from alts because it has the Color Rash restrictions. If they are going to have alts, let them have alts. Agreed. It’s been a weirdly half-assed promotion. It is interesting, because before color rash, alternates were either throwbacks, or a color swap of an existing design. While that was pretty simple, it seems to have worked far better than what happened with the rash. This is probably because the previous alts generally weren’t designed with a mono-look in mind. As someone who thinks teams should stick with their signature uniforms the news of additional opportunities to dress in costumes rather than the actual uniform is unwelcome. If it was up to me teams would just have standard home color and away white. If you must have an alternate how about on Thanksgiving every game features historic rivalry matchups and you wear throwbacks that weekend? You had my support at one home color and a road white. Unfortunately, you lost me with if you must have an alternate. Those Wakanda soccer jerseys are awesome! I’m a sucker for any kind of cross-sport or fictional jersey concepts. The away kit is pretty nice. The home kit doesn’t make much sense though. It would be like if England wore uniforms based on their monarch’s military attire. The away kit is based on the Dora Milaje uniform, so also “military”. I will never understand why they didn’t turn the Thursday night games into Throwback Thursday. But then that’s too easy, and the NFL is nothing if not a league that consistently gets in its own way. As we all know, the one-shell rule makes throwbacks problematic for certain teams. And a few teams have never changed their uniforms in any appreciable way (Panthers, Texans), so no throwback would be available for them (although they could presumably go with fauxbacks). The Ravens fall into the don’t-have-a-throwback list as well as they can’t legally wear their original logo. Well, July 2nd is when the Continental Congress actually voted to declare independence from Britain; the 4th is when they officially approved the wording of the Declaration. And Canada is still ruled by the Queen, the very same Queen who rules Britain. Makes perfect sense to me! I always thought the Blue Jays should play a game in the U.S. every July 4 to maximize the number of games in American stadiums in exchange for always getting a home game on Canada Day. That would be awesome. He could join the small fraternity of players who wore the same name on the front and back of the jersey, like Curtis Pride (when he played for the Nashua Pride) and Jerry West (when he played for the Western Conference All-Stars). Alas, his name is spelled juuust slightly different from the city, so it would constantly look like a misspelled NOB situation. Which is fascinating in its own right. Don’t forget Aaron Nola playing for the New Orleans team a few years back! 1. My 3-day vacation from watching MLB began yesterday. It’s just too painful to watch teams like the A’s, Giants, and Pirates in the flag-desecration outfits. Even the Nats look stupid and they own the colors. 2. If the one-shell rule goes away, the Packers using a green helmet with an appropriate alternate uniform would be solid. Heck, they could even go green helmet with their regular white over gold and it would be a fun change of pace. Those Packers helmets are absolutely gorgeous. I would love to see them on the field, even for an exhibition game. The photo with Nats manager Davey Martinez and Red Sox manager Alex Cora celebrates the first time two Puerto Rican-born managers faced off. Martinez usually sends someone else out with the lineup card but wanted to do it last night to mark the occasion, per reports. With all respect to being patriotic, the Stars & Stripes uni MLB is doing is a total failure. For any team that doesn’t have red/blue as its team color -Athletics, Rockies, Orioles, Giants, etc -it’s an ugly distraction. Bottom line, keep the Star Spangled team logo on the regular everyday team caps, and call it a day. Even better, just wear the flag patch on the sleeve and/or side of the hat. It is all about merchandise. People who love the specialty hats like the stars and stripes, etc are going to buy them whether the players where them on the field or not. I wish the various pro teams and their respective leagues would stop letting merchandise decide what is worn on the field. If the hats matched the team’s color scheme (E.g. : Cardinals in red hats, Braves in blue and so on) that would be great. I’m assuming the Cards’ is navy because that’s what they typically wear on the road against red-clad opponents. All the pics I saw from last nights game, I was wondering if someone broke out the Bedazzler in the clubhouse, but “diseased” is far more appropriate. 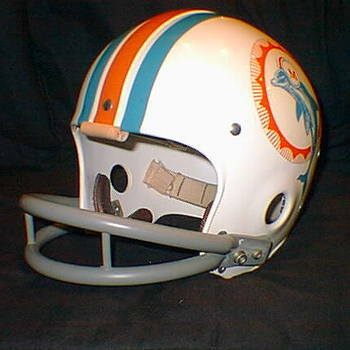 Never heard the term “snubbers” used for helmet bumpers before. Anyone? Thank you. Just one of the many reasons I’ve been a daily reader for going on 6 years. I love learning about these little nuances I would’ve never thought twice about. The Patriots team issued bag on the eBay corner likely belonged to Brent Williams. That is, if the seller is certain it is from that time period. But given that nobody wore 96 until the 80s, the seller’s research skills are a bit suspect. It could be Mike Jones as teams back then were always slow to phase out old practice gear. On the Chipper Jones bobble head, have the Braves ever worn a solid blue helmet with the current home jersey? The ticker entry says “a combination he never wore”, but I don’t think the TEAM has ever worn that combo, with or without Chipper. I’m just curious if I’m forgetting something.